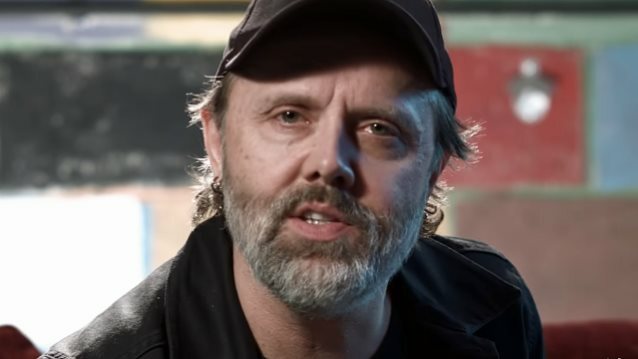 METALLICA drummer Lars Ulrich took part in an hour-long one-on-one conversation with radio host Andy Hall as they revisited the "Master Of Puppets" era, continuing the band's celebration of the reissue/remaster of that album. Originally broadcast on radio stations around the country, the special, which can be heard below, features songs from the LP and contains exclusive music recorded live at Festival Hall in Osaka, Japan on November 18, 1986. Asked if he is personally interested in listening to a recording of METALLICA's final show with bassist Cliff Burton, which is included on the super-deluxe, box-set reissue of "Master Of Puppets", Lars said: "Oh, I have heard it. I mean, obviously, it's an unusual experience to listen to these songs if one's head goes to, 'That's the last time we played these songs with Cliff.' But 31 years later now, we're in a place where it's okay — we can deal with it. People [ask us], 'How do you feel?' I mean, it was a mindfuck at the time, but you sort of have to find a place where you can find a way to move and continue forward with that experience under your belt. It's part of that couple of years when you talk about 'Master Of Puppets', when you talk about writing it, when you talk about the Ozzy [Osbourne] tour, and you talk about this and that, and when you talk about Jason Newsted, obviously you talk about Cliff. Cliff will be forever part of this experience, and Cliff will forever be part of this band and we'll always think of him as our brother — that will never stop, and that hasn't stopped. He's part of the METALLICA family as we continue to move forward. I don't know if 'sad' is the right word — peculiar or odd to listen to. But a lot of that time still is kind of… When I think back to that time, a lot of it's a blur." On September 27, 1986, Burton lost his life at the age of 24 in a coach crash near Ljungby, Sweden. Ulrich recently spoke to Rolling Stone about what he remembers about the final show with Cliff. He said: "We'd finished playing all the 'Odeons' in England, which are these old, 3,000-seat movie theaters and we got to Scandinavia where they were more like ice-hockey holes — smaller, colder, darker. It was a different vibe. We played the show in Stockholm, and it went incredibly well. I think it may have been a rare case where we actually played an additional song that wasn't on the setlist, because the show was so good. That's not something we did a lot then or now. So there was a good vibe." METALLICA guitarist Kirk Hammett added: "It was significant because it was the first show where James [Hetfield] played guitar again. He strapped on a guitar and was able to play the encore; I think it was 'Blitzkrieg' or something. But I remember the five of us, including [fill-in guitarist] John Marshall, being really stoked James was back and playing and looking like was gonna make a pretty healthy recovery. I distinctly remember that show being good, and the feeling when we got offstage was really great and positive and forward-looking. Like, 'Great, James is back in and it won't be long 'til we're back to our old selves again.' It was that kind of mood after the show and then the accident happened and it literally felt like we were going from a hopeful sort of circumstance to one where we found ourselves in into a deep, black pit." Burton's huge talent and achievements were chronicled in book form with the 2009 global publication of "To Live Is To Die: The Life And Death Of Metallica's Cliff Burton", written by U.K.-based author Joel McIver and published by Jawbone Press. The foreword was provided by Hammett.